You may know we've been involved with ICC in China, Hong Kong and now Canada. We're taking part in Walk the Wall (WTW) in Toronto this year, having recently relocated to Canada from HK. 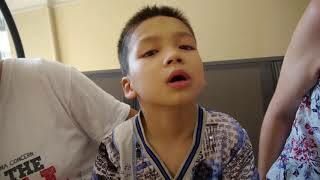 WTW is a global fundraising event that supports International China Concern (ICC) working in China for 25 years now to give life and end abandonment to babies, children and young adults with disabilities in China. We've previously taken part in Hong Kong, and most excitingly in 2017 we walked with the kids in China. This year the theme is that ordinary people (like you, like us) can do extraordinary things together, and will include option to dress as a Superhero for a bit of extra fun! We'd love for you to join in supporting ICC's work by sponsoring us and helping to make a real impact. Funds raised will help to hire and train caregivers for the kids, ensure they all have good meals. It pays for each child's medical costs and gives them specialised education and physical therapy. But most of all, the funds we raise makes sure each of these children knows love and that they are valuable. Help me by making a donation today. Thank you for your support! It DOES help. Keep up with the good work !